A 14 night Transatlantic cruise, 2 nights in New York and 7 nights onboard Queen Mary 2! A discretionary gratuity of £12.50 per guest for suite staterooms, £11.00 per guest for standard staterooms on Carnival and Cunard charges $11.50 per person, per day, to the shipboard account of passengers in Britannia accommodations. The amount is $13.50 for passengers in Grill Class accommodations. This will be added to your onboard account (per day charge). This gratuity will be shared amongst those staff who help provide and support your cruise experience, including your stateroom attendants, dining, bar and culinary services staff, as well as others who work behind the scenes to enhance your overall cruise experience. A 15% gratuity is added to beverage purchases and the cover charge of the Chef’s Table. Back when ships were used less for cruising and more for travelling, the transatlantic was the big one, the sort of trip a person might take once in their life. Today, the transatlantic is less about passage than it is a rite of passage, a cool throwback voyage that travel enthusiasts should try at least once. And when you take yours with Carnival, not only will you find cool island ports sprinkled throughout your time at sea, but you’ll enjoy Carnival’s signature onboard fun in between stops. See the bright lights of the Big Apple, an international mecca and melting pot of culture, cuisine, architecture and art. Salute the great Statue of Liberty and prepare for the city that never sleeps. Visit colourful Greenwich Village, the legendary Central Park, or any number of world-famous museums, galleries and sights. Or devote your New York time to shopping the big-name stores. Leave the city that never sleeps for seven soothing nights on Cunard's iconic Transatlantic Crossing. It's perfect for relaxing and unwinding in sophistication and luxury as you sail leisurely east. Make your way to Southampton Cruise Terminal where you'll find Carnival Mardi Gras, your home for the next 14 nights. Carnival Mardi Gras shouts “fun!” at the top of its lungs. Carnival are building this new Mardi Gras to live up to that legacy, so start daydreaming now! For one thing, this ship introduces Zones — six themed areas packed with brand-new experiences for eating, drinking and spectacularly getting down to fun. More announcements are still to come, but they’re all ready to pull the wraps off what may be the most thrilling: BOLT™, the first-ever rollercoaster at sea! Everybody can enjoy Mardi Gras, sailing in 2020. Come on down! Las Palmas is part of an archipelago - a group of islands. Enjoy the amazing weather on one of the many beaches, snorkel for the day and explore the sea life while enjoying the sea breeze or discover the Maspalomas Dunes. With sand that was formed at the bottom of the ocean, this 1,000-acre beauty is protected as a nature reserve. Grab your camera and snap away. Hike to the bottom of the vast Bandama Natural Monument, two land forms that include a towering volcanic crater and huge 3,300 ft. wide opening. Santa Cruz de Tenerife has been named as one of the top-five best places to live in the entire world! Visit the national park of Las Canadas or sample the delicious wine and cheese from the village of Taganana. You could even try and uncover the story behind the Güímar Valley pyramids. 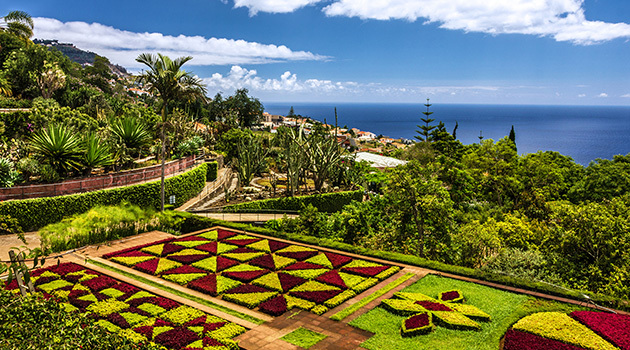 Funchal has got exotic flavours and colourful vistas in droves. Their homemade sweet wine is a treat for your senses which only compares in exquisiteness to the enticing aroma of the wild flowering fields by the salty ocean breeze. You're never too far away from fun on a carnival ship! Grand Central - the entrance to the ship and to your holiday - is your first impression of all the fun to come. They make sure that this, the very heart of the ship, screams "welcome aboard the fun!" With multi-level panoramic views, Grand Central gives you the perfect place to enjoy the hustle and bustle. Let the fun really begin in The Punchliner Comedy Club. Up on stage you will find some real pros who know how to wedge a little laughter into anyone's evening. The year-round mild weather inst the only thing to attract visitors to Ponta Delgada. There is also the rolling hills, volcanos and sparkling lakes. Take a day trip to Ribeira Grande and find a rick, picturesque town on a volcanic plateau. See all my gorgeous structures, including the striking church of Espirito Santa. POOL DAYS! Whether today's the day for a bit of a dip, a dash of splash or even some swimming - or just a serious poolside lounging session - your Carnival cruise has just the pool for you. In the evening show up to the open-air Lido Deck pool area ready to have a good time under the stars at the Mega Deck Party! The ship's DJ, cruise director and entertainment staff will be on-hand to get things going... and to keep everyone moving. Disembark Carnival Mardi Gras in New York and make your way to your 4* hotel for a 2 night stay. The City That Never Sleeps and you won't want to either. You'll need to visit the Brooklyn Bridge, Broadway, the Freedom Tower and the Rockerfeller Center whilst you're there! Also not to be missed is Central Park and the billboards, skyscrapers and bustling crowds of Times Square. We have included Top of the Rock tickets too! Check out of your hotel and a private transfer will take you to the cruise port to step onboard Cunard's QM2! Step into a world of effortless indulgence and inspiration aboard the world's only true ocean liner, Queen Mary 2, for the iconic Transatlantic Crossing. Run a mile around deck before dusk or dance until just before dawn. The choice, as always with Cunard, is yours. There is as much or as little to do as you please, with more possibilities than you have time to discover. Savour some of the most exquisite, timeless restaurants at sea, from the Steakhouse at the Verandah inspired by both sides of the Atlantic and the enticing world cuisine of King's Court, to 24-hour dining in your stateroom.